Well, I made it 3/4 of the way through. Don’t know how that’s possible since I’ve been sick for this WHOLE ENTIRE PREGNANCY. Alright, that’s probably a little bit of an exaggeration but it started with 14 weeks of round the clock nausea, then daily headaches, then a stomach bug, then this ridiculous cough. I would like to be well when I have this baby. Is that too much to ask? you are so dang cute! i love the dress too. That is a rockin' dress. I turn 29 weeks tomorrow… I have yet to post a picture. I keep waiting for the Great Navel Trench to go away. I think if I only had 1 belly, I'd show it around more. You look lovely! You look great! I love the dress. I guess sickness is what comes with a winter pregnancy. Well, not nausea, but that was just an unfortunate surprise. Only 2 more months! Yay! I would say that asking to be well for a few days in two months is a reasonable request. Well, you look great despite not feeling well! 30 weeks?! Wow, time seems to be flying! You look fabulous. I have loved seeing your updates and now wish I had taken more pictures when I was pregnant. I just hated how I looked in pictures so much by the end, I didn't want to see them. As for the sickness, I hope you get better but I felt like I just couldn't get well when I was pregnant. Holy moses! 30 weeks! It's getting serious now! I'll cross my fingers for you that you start to feeling 100% soon and stay that way! Is it wrong that sometimes I don't comment because "hey, she's got enough comments already!"? Yes? Here's my un-comment, then. 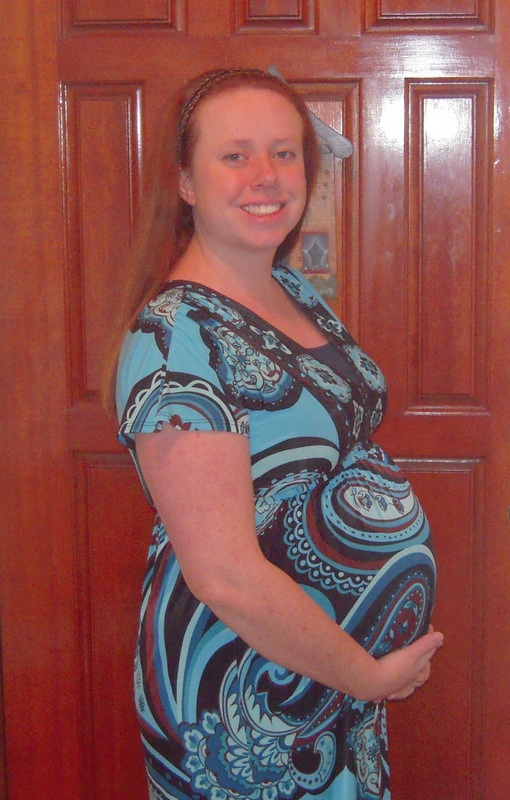 I love non-maternity maternity dresses. That one is very cute. I guess I ran across your blog and thought I stop and leave a message: You look absolutely stunning pregnant!